Renew & revitalize your kitchen & storage areas with cabinet refinishing. 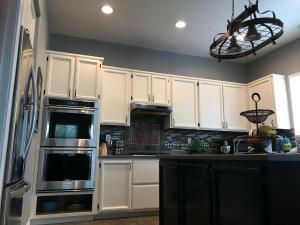 Brand new custom cabinets can take up a big chunk of remodeling your kitchen, bathrooms & storage areas. Save time & money with our Cabinet Refinishing services to renew & revitalize without breaking the bank. Providing a fresh new look to your aging or antique cabinets is an often overlooked opportunity when remodeling. Painting, staining, sanding & repairing your storage areas is a a great recipe for cabinet refinishing. Your space is our canvas. We take great pride in our works & services.